The first flowering plants spread throughout the world. The mid-Cretaceous period is marked by a series of oceanic anoxic events (OAEs). To understand how these events occur it might be worth discussing the phosphorus cycle and how it affects all living things. The complete phosphorus cycle requires a combination of geological, biological and chemical factors to be present in order for phosphorus to be effective at maintaining long-term health (and size) of all animals of the vertebrate kind as well as plants of all species. The cycle begins through the familiar geological route of volcanism spewing large quantities of lava and hot ash on land to help create fertile soils. Here the phosphorus levels are abundant (1). Plants grow happily in these soils as this is how they can absorb phosphorus, among other essential chemical elements, in the presence of adequate water and certain fungi and other microbes in the soil to assist in the efficient uptake of these elements through the root systems. As the healthy plants grow, some of it is eaten by herbivores where a certain amount of phosphorus is used to build the all-important genetic storage molecule DNA and its messenger RNA, as well as in the development of healthy and strong bones and teeth. This in turn gets taken up in the bodies of predators consuming the herbivores and so benefiting from the phosphorus for the same reasons. A certain amount of phosphorus does get lost in the animals' excrement, and the rest is returned to the soil upon death to hopefully maintain the cycle from a purely biological perspective. However, high levels of rainfall and/or limited ground cover from plants may expose the fertile soils to greater erosion, or see some of these chemical elements reach the river systems. Depending on the landscape and how rivers flow, much of this material in the soil from decaying animal and plant matter and the excrement left behind get washed out to sea (if not deposited in large deltas). If unusually high levels of phosphorus start to accumulate in relatively stagnant waters, green algae can grow in vast quantities. While algae blooms may technically produce oxygen, this is not dissolved in the water. Furthermore, when the algae dies, decomposition of this material and other organic matter will cause a depletion of oxygen levels in the water. Then we have a situation were animals with gills living exclusively in the oceans die in these oxygen-deprived waters, leading to what is known among scientists as an oceanic anoxic event (OAE). Otherwise, other animals in the water that can breathe in oxygen from the atmosphere will tend to absorb (and probably grow larger) and later deposit the phosphorus to the sea bed once they die. Finally, to fully complete the long phosphorus cycle, global climate change (usually a cooling of the planet) and/or movements in the tectonic plates or volcanism can lower sea levels and/or raise the plates to a height that allows the sea bed to be exposed to the weather. Here, the phosphorus can be dissolved and released back to the plants and ultimately to the animals that feed on the plants. As can be seen, the phosphorus cycle is certainly important to the development of healthy animal and plant life. More specifically, a deficiency in phosphorus levels in the soil can lead to poor growth, smaller fruits, and leaves will change to a blue colour with some purple tinge. Low phosphorus levels for plants is not a common disorder, but it can occur. The disorder is most prevalent in areas of high rainfall such as in equatorial rainforests. Also, acid, clay or poor chalk soils tend to have limited amounts of phosphorus. Thus a region of phosphorus poor soils can produce not only less food for plant-eating animals, but it can also make it harder for larger animals to survive. 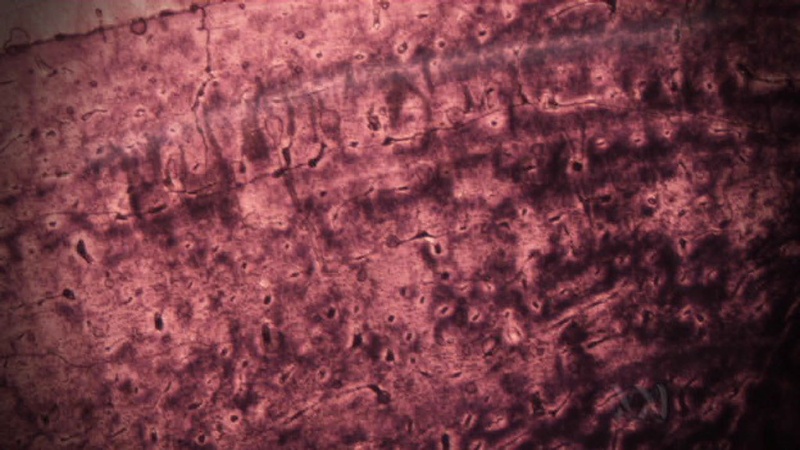 Speaking of animals, we know that phosphorus does help to build strong and durable bones and teeth. In the early periods when dinosaurs began to colonise the continent, the animals grew very large thanks to a substantial amount of phosphorus and calcium to build massive bones. Later, the levels of phosphorus in the soil would go down. Any significant reduction in this vital chemical element would probably not favour the development of large animals, or would seriously curtail their lifespans (i.e., a higher risk of brittle bones developing and poorer quality teeth to munch through the tougher fibrous plant materials). Could this phosphorus deficiency explain the smaller size of most dinosaurs in the Cretaceous period compared to those that lived in the Jurassic period? Perhaps a test of the chemical composition of fossilised bones of the few remaining larger Cretaceous dinosaurs living in areas considered to be opening up to these savannah landscapes (probably in temperate latitudes) and comparing them to similar sized fossils from dinosaurs of the Jurassic period may help to reveal a difference in the ratio of phosphorus and calcium. If so, an x-ray fluorescence spectrometer would be the ideal tool to assist with this task. With all this phosphorus and decomposing organic matter reaching te oceans from large river systems, Handoh & Lenton (2003) have noted periodic oceanic anoxic events (OAEs) occurring in the late Jurassic (160-150Ma) and mid-cretaceous (120-80Ma), and possible in the Paleocene (65-61Ma) and Miocene (approximately 15Ma). These events could indicate high levels of phosphorus in the oceans for promoting the growth of green algae, which begs the question as to how much phosphorus was present on land and whether a depletion of this essential element could be the leading cause for OAEs. In the Cretaceous, it would appear phosphorus levels were going down in the soils in certain parts of the world and somehow ending up in the oceans at certain times in high quantities. Follmi (1996) has suggested another possible OAE around 93.5Ma before returning to normal following the burial of phosphorus in the sea bed. These periodic events does strongly suggest heavy leeching of phosphorus on land was taking place as decomposing organic matter gets washed away into river systems and eventually into the oceans, only to be replenish by some geological means after more than half a million years. Focussing on the mid-Cretaceous period, Handoh & Lenton also noted that OAEs at this time were "remarkable because of their number and recurrence at fairly regular intervals". They claim OAEs occurred at approximately 120Ma, 112Ma, 99Ma, 91Ma, and 87Ma, and usually last less than half a million years before a full recovery of oceanic conditions is achieved. Compared this to the Jurassic period, for instance, and it appears the only OAE documented occurred around 183Ma, according to Gronstal (2008) and Pearce et al (2008). It means that, for some reason, there had been heightened OAEs around the middle of the Cretaceous period. Looking beyond all this study into OAEs, we see the work does have some rather important ramifications for humans today. Indeed, it is worth noting that phosphorus deficiency on land is playing an increasingly serious problem in the 21st century. Phosphorus is definitely ending up in the oceans from man-made fertilisers. Already there is talk of just three countries in the world (one of them is Morocco) having the last remaining natural "on land" sources of phosphorus. Other countries, notably New Zealand, are considering drilling phosphorus from the ocean bed to support its agricultural industry. Combine this with global warming and melting of the Arctic/Greenland and Antarctic ice and we will also see a slowing down of the ocean currents, especially in the Northern Atlantic as the temperature differentials of the water at different latitudes is reduced, resulting in more stagnant waters appearing in different regions. And extra phosphorus in these waters will probably see a return to another OAE with subsequent deaths of numerous marine animals if they do not migrate to other parts of the world's oceans. This is the sort of situation we can all expect to face very soon given the way humans are managing the planet at the moment. 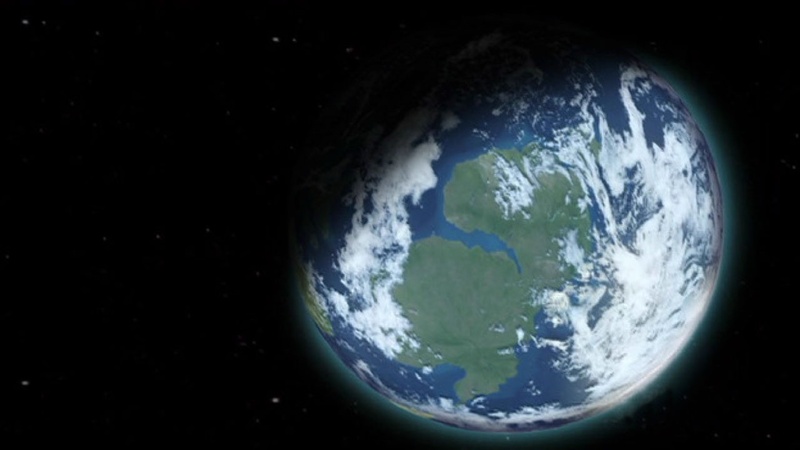 Earth in the mid-Cretaceous period around 94 million years ago. Image © 1997 Christopher R. Scotese. As of 2014, an updated map can be downloaded from the Colorado Plateau Geosystems, Inc. web site and created by Professor Ronald C. Blakey of Northern Arizona University (NAU). Beginning in the early Cretaceous and culminating about 92 million years ago, the final breakup of Pangea took place, leading to rapid and quite significant seafloor spreading and a release of a massive amount of carbon dioxide from the interior of the planet. As a result, extreme warmth saw the planet virtually free of polar ice caps. Indeed, tropical temperatures extended to extremely high latitudes as indicated by fossils of a crocodile-like creature known as champsosaurs found in late Cretaceous sediments north of the Arctic circle. This creature avoids at all cost extended periods of sub-freezing temperatures, so finding fossils at such high latitudes gives evidence of an unusually warm period. These warmer conditions would continue to persist well into the Eocene period. With the polar ice caps fully melted, sea levels had risen sufficiently to cause low-lying areas in central United States to get flooded (known as the Western Interior Seaway extending from Texas into British Columbia). By 94 million years ago, the Tethys Ocean covered the southern parts of Europe, and so effectively separating the continents of Laurasia from Gondwana. It should be noted that there had already been a break up of Gondwana with India  already an island  moving away from what would effectively be Antarctica today and was now situated at the equator. India would continue to advance northward, colliding with Asia and forcing a new mountain range to develop known as the Himalayas. Whereas Africa and South America was nearly completely separated from each other at this time. As all these significant geological and climatic events took place, dinosaurs still dominated the landscape, but not as great in sizes as had been the case during the Jurassic period. A diminishing forest size and greater treeless "savannah-like" environment (i.e. mostly ground-covering ferns competed well for the light) also meant there was less food available to support very large animals on land. Combined with lower phosphorus levels in the soil needed to build large and strong bones for very big animals, a time came when the massive plant-eating and carnivorous dinosaurs of the Jurassic Period gave way to smaller and more agile dinosaurs of the Cretaceous period. This meant that herbivores of the dinosaur kind did not eat grasses in the Cretaceous period. 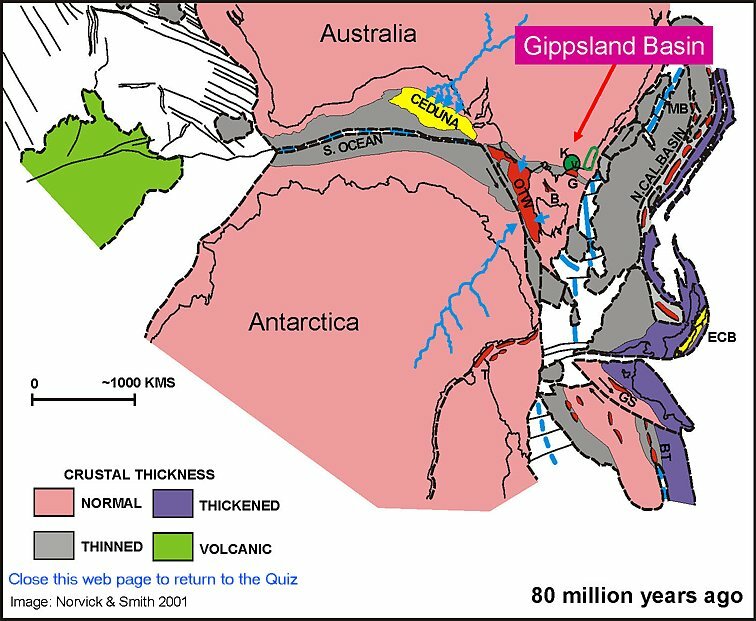 Australia and Antarctica were once a single continent nearly 80 million years ago. (Source: Petroleum Exploration Society of Australia web site, 2007). Since the rise in sea levels created isolated communities, dinosaurs had diversified into unique forms based on their location. Focusing on Australia for a moment, we see extensive inundation of the Australian continent by water at this time. Later, the water slowly regressed to form a large inland sea (several times the size of Tasmania) covering much of the enormous depression of central Australia (first formed during the Triassic and Jurassic Periods). Feeding much of the rainfall along the Blue Mountains in the summer time, rain falling on the mountains helped to replenish the large inland sea and turn it into a large body of freshwater. Regression of this inland sea continued and may have been accelerated during the Pleistocene Epoch with the arrival of the first aborigines from Asia with their knowledge of fire and its application to the landscape resulting in a further thinning out of the forests and greater exposure of water on the ground to evaporation. Nature would also help the situation somewhat as the Blue Mountains got weathered down to size leading to fewer rainclouds. Today, the only remains of this inland sea is a small body of water called Lake Eyre (3). Every 10 to 20 years the lake gets filled up during La Nina weather patterns where the odd heavy rainfall along the western side of the Blue Mountains is substantial enough. When it happens, the rain tends to return and persist for longer in the summer months as the cycle of moist air from the centre of the continent is brought back to the mountains. Indeed, during those rare moments when there is substantial water in Lake Eyre, it is observed that the probability of rain along the western side of the Blue Mountains does increase substantially, and the likelihood of drought is virtually non-existent (but only when the La Nina effect is present where warm Pacific ocean currents reaching Australia, the eastern side of the Blue Mountains tends to receive very high levels of rainfall. Sometimes the rain clouds may move over the mountains to drop enough water on the western side. At any rate, without this extensive body of water filling the centre of the continent, the south eastern corner of Australia quickly turns into one of the hottest and driest regions during the summer months. The terrible bushfires we see in this part of the world are a natural consequence of this limited humidity and rain coming from the centre of the continent. Artist impression of Australia and Antarctica joined together nearly 70 million years ago. During this time, dinosaurs would continue to exist on this continent despite the southern latitudes it was located. However, the somewhat frisky and colder conditions, especially in the winter, would see dinosaurs get smaller and more agile. Larger dinosaurs would only move south when the conditions became warmer and migrated back to the warmer northern regions towards the end of the summer months. Image © 2007 ABC documentary Dinosaurs on Ice. Globally speaking, Professor Allan Graham from the Biological Sciences and Geology at Kent State University stated on page 191 in Late Creataceous and Cenozoic History of North American Vegetation: "…the climate of the Late Cretaceous through the Early Eocene was warm, equable, and maritime. Coastal assemblages show that megathermal conditions (MAT> 20°C) extended to about 48° N."
Also any cold regions were not considered extensive by any means. As Graham confirms on page 191: "Areas of microthermal temperatures were highly restricted and at times possibly limited only to mountains in the polar latitudes (Wolfe, 1987)." Therefore, on the whole, prior to the late Cretaceous, conditions were warm. However, by the late Cretaceous were definitely getting cooler compared to the Jurassic "hothouse" period, but still considered warm by today's standards. Perhaps the exception to these constantly warm conditions is the continent formed by Antarctica and Australia in the southern hemisphere. Given how significantly far south this continent was, it would create distinct seasonal changes from the relatively cold (with snow) in the winter, especially over much of Antarctica and southern Australia, to the warm and moist conditions in summer (with less seasonal variation in the far northern parts of Australia). This meant that dinosaurs over this continent had to cope with different seasons and the resultant variation in temperature. 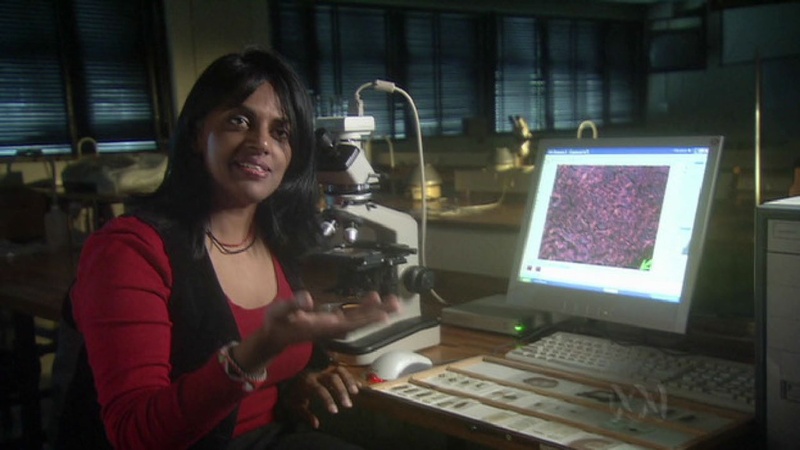 And, in fact, we learn, according to Anusuya Chinsamy-Turan of the University of Cape Town, South Africa, that the cell structure of reptilian bones show evidence of having responded to climate change on a seasonal basis as well as periods of variability in the food supply. Anusuya Chinsamy-Turan of the University of Cape Town, South Africa. Image © 2007 ABC documentary Dinosaurs on Ice, written and directed by Ruth Berry. For example, when food is scarce, a distinctive and narrow growth ring appears showing reduced growth in the bone structure. On the other hand, when food is plentiful, the growth of the bone is quicker leading to the less prominent and more spread out growth ring. 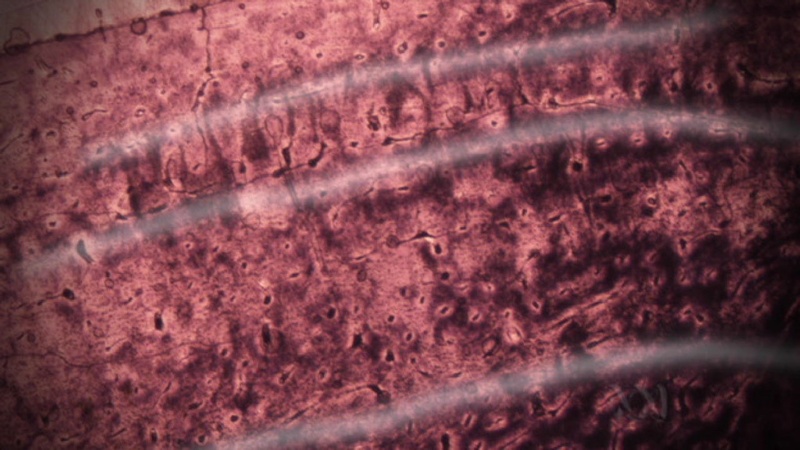 Growth rings in reptilian bones. These rings are not observed in mammals. Image © 2007 ABC documentary Dinosaurs on Ice, written and directed by Ruth Berry. Marked here are the rings showing the reptile had reduced food supply (perhaps suggesting either a colder season while the reptile did not migrate, or a period of reduced food supply irrespective of whether the reptile migrated or not). Image © 2007 ABC documentary Dinosaurs on Ice, written and directed by Ruth Berry. These rings can be considered to be due to variation in climate change suggesting food became scarce in winter, and in the summer it became more plentiful. But other factors can also produce these rings. For example, a larger and less agile reptile is likely to have growth rings in its bones than a smaller and more agile and active reptile. When dinosaur bones of those that once lived in the southern continent of Antarctica and Australia dated to this period were analysed, scientists discovered they can have growth rings and no growth rings. Where the dinosaurs have no growth rings, it is usually because the animals have access to a plentiful supply of food all year around (perhaps these animals migrated or were mobile enough to gain access to the plentiful food in one area  mainly in the northern parts of Australia). Where the growth rings exist, something in the environment would see the dinosaurs go without food for a period of time before the food supplies returned in abundance. In the case of the cell structure of bones from a common plant-eating dinosaur known as Hadrasaurs found on the continent of Antarctica and in the land mass lying over the Arctic region (to become Alaska today), Chinsamy-Turan noticed there were no growth rings. These are relatively large animals about the size of a bus whose bones are found in relatively cold polar regions of the planet (suggesting that these were deposited at the time the creatures died during the summer period). Scientists are certain Antarctica would have experienced snow in the winter time. Yet these dinosaur bones discovered on this continent showed no growth rings. Likewise the same thing can be observed for dinosaurs found in the Arctic region. Why? 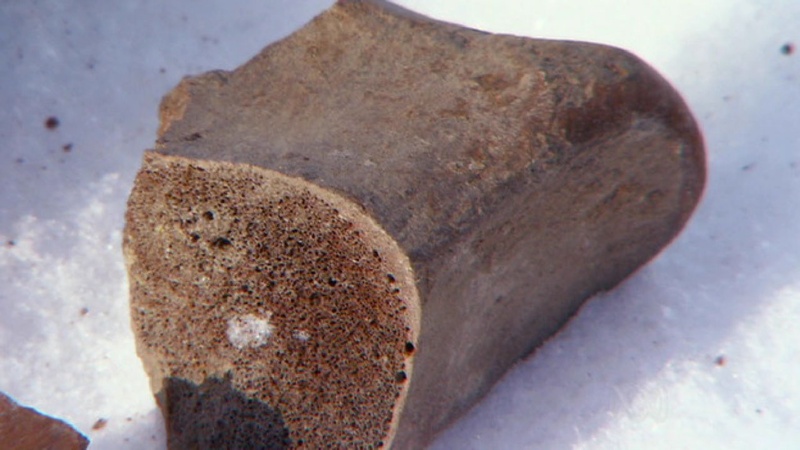 A sample of dinosaur bone extracted from Alaska. Image © 2007 ABC documentary Dinosaurs on Ice, written and directed by Ruth Berry. Either these allegedly cold-blooded dinosaurs had somehow found a way to adapt themselves to the cold and still had access to plenty of food, or they constantly migrated to follow the warmer conditions. The former case seems less likely for the following reason: During winter in the Antarctic continent, darkness and intense cold would persist for months. Just to add to the woes of these plant-eating animals, plant life would have entered a dormant stage in the winter, thereby ensuring limited production and growth of leaves. If the growth rings in bones are non-existent and growing at the same rate, then it means the temperature in the environment must be warm and constant and have access to regular food. Furthermore, these hadrasaurs are not noted for having fur on their skins to keep them warm during the winter. Without an adequate internal heat-generating mechanism to adapt to the cold, most scientists are now facing the possibility that polar dinosaurs (especially the larger ones) probably had to migrate from Antarctica into Australia to follow the warmer weather and where more lushes plant life would exist and would only return south again to give birth to new offsprings as well as enjoy slightly cooler conditions compared to the equatorial regions, but mainly the former by escaping many of the bigger predators; and also in the land bridge connecting the Arctic region to the warmer North American and Asian regions. Furthermore, the conditions for migration had to be warm enough. Otherwise the bones of polar dinosaurs must show evidence of growth rings, which they do not. The large dinosaurs had to be on the move to follow the warmer weather. If dinosaurs did migrate, the larger variety of creatures would have to produce one or two relatively large offsprings in the early summer months near the polar regions (the time when there would be less predators around). As soon as they were born, the offsprings needed to eat plenty of food quickly during the summer months to gain rapid growth while the parents protected them from the numerous smaller predators living in the polar regions (compared to those near the equator, which tended to be larger and probably no less ferocious than those living in the polar regions) until they were ready to make the long journey to follow the warmth. Therefore, the discovery of bones with no growth rings in Antarctica suggests a number of polar dinosaurs died naturally from old age or natural disasters, or were attacked by predators during the warmer months (and not during the winter). This is currently the most logical explanation. A large 12 kilometre wide piece of rock travelling at 72,000 kilometres per hour made its way from the asteroid belt region (perhaps dislodged and sent hurtling through space by a comet impact) to affect life on Earth at this time. The impact created by this unwelcome visitor lead to a massive extinction of animal and plant life throughout the world. Definitely not your average volcanic eruption episode as we have discovered in the past to partly affect life on Earth during a moment when a continent had to suddenly break up. This event of around 64.5 million years ago was much more devastating. In the days and few weeks following the impact (which unleashed the energy equivalent to a billion Hiroshima atomic bombs going off at once), virtually all the dinosaurs that ever existed throughout the world had either been vaporised, burned or, as time passed, starved or froze to death. Although the number of dinosaurs were already on the decline in various parts of the world nearly 100 million years ago, scientists are convinced that at least one large asteroid was responsible for the eventual demise of the dinosaurs at around this time. Among the ones who had perished were many early marine birds, all of the largest to mid-range plant- and meat-eating dinosaurs both on land and in the oceans, all of the remaining smaller dinosaurs during the mini-ice age period that ensued when the sky was covered with dust and sulfur (except for some birds and smaller reptiles, such as the crocodiles), and much of the plant species that lived in the watery environment. Most of the plants on land also perished as massive forest fires ripped through the continents. In total, 75 per cent of all species had perished. The asteroid must have weighed roughly a trillion tonnes. Either that, or the damage was greater because it crashed to Earth at high speeds into what was essentially a couple of hundred metres of shallow waters next to the land mass of the Yacatàn peninsula in central America (4). This is considered by the scientists as the worse case scenario as an impact of this magnitude over what was essentially on land (with little water over the top) would have thrown up a lot of dust and chemicals (mostly sulfur from the vaporised gypsum in the ocean bed) into the atmosphere. 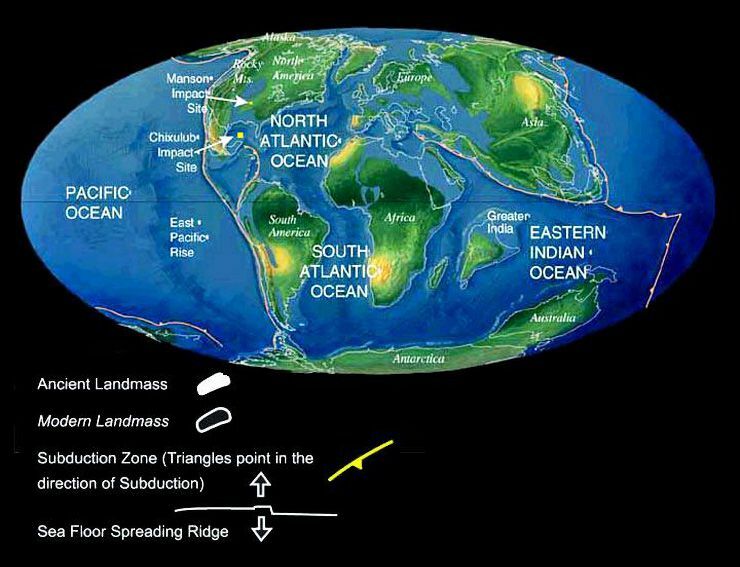 If the asteroid had landed deep in the ocean of the Pacific or Atlantic, things would have been different. The most that would have happened is create several massive tsunamis, but the death toll would have been much less, and there would be every chance the dinosaurs would continue to survive. Not so on this occasion. Not so lucky for the dinosaurs, but fortuitous for the mammals that would later emerge and dominate the planet. Knowing the impact was essentially over land, the consequences to life from the impact were almost undescribable. For a start, the collision created immediate and prolonged earthquakes exceeding 10 on the richter scale within 300 miles of the impact point. A killer blast wave of highly compressed and heated air travelled from the epicenter at 12 miles per second destroying all life within a radius of 100 miles of the impact site in a time frame of less than 10 seconds and nearly all the dinosaurs up to a radius of 300 miles in 25 seconds. And if that wasn't enough, animals near the impact site had to contend with several mega-tsunamis of between several hundred to a thousand feet high travelling 200 miles inland to drown the few surviving land-based animals; followed by a searing heat wave travelling right around the world and igniting extensive world-wide forest fires. Still, more was to come. In the months that followed, an intense mini-Ice Age prevailed over much of the planet as dust, smoke and an incredible amount of sulfur compounds got reached the upper atmosphere to screen out the sunlight. When the sky was finally cleared of the pollution within a few months, massive global warming greater than we will experience this century by humans with our desire for burning fossil fuels took place. The warming at this time would last at least a thousand years. As for the dinosaurs living on the opposite side of the planet from where the impact site was, their fate was not with heat and fire. It would be the terrible and intense cold. As dinosaurs had no internal heating mechanism to keep warm, even for those few smaller dinosaurs that could better adapt to the cold in Antarctica and Australia (they were joined together at this time), none could withstand the sudden drop in temperatures. Any modestly large dinosaurs still roaming around meant finding enough food would face a painful death. In fact, so serious was the cold period that it effectively contributed to the extinction of the last remaining land-based dinosaurs and anything that depended on the dinosaurs for its existence. Those land-based animals that could survive underground inside caves or burrows and hibernate during the cold had the best chance of surviving the disaster. Animals living in deep oceans also had a reasonable chance of survival so long as their food supply wasn't entirely reliant on large land-based animals. Otherwise, the best chances were for those with small body sizes requiring less food. Two artist impressions of the collision between the Earth and the asteroid which destroyed all the great dinosaurs. The more accurate version would be the one below. According to a team of geologists led by Dr Walter Alvarez, the asteroid collided with the Earth in an area now covered by the Gulf of Mexico. Within 90 seconds of the impact, the asteroid left a hole in the Earth nearly 18 miles deep and 110 kilometres across. Further studies by other scientists have provided additional information about the asteroid. We can now state confidently that the asteroid size ranged from 9 to 16 kilometres in diameter (probably closer to 12 kilometres) travelling at over 40,000 miles per hour (or around 12 miles per second) when it entered the atmosphere from the south-east before colliding with the Earth at a 30 degree angle to the ground. 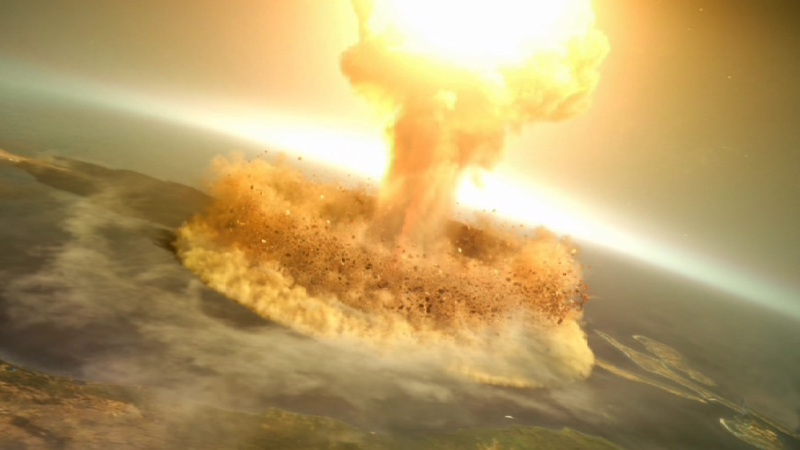 All this information has been determined after careful analysis of high speed impacts of projectiles hitting sand, mathematical models simulating the impact and the shape of the debris plume using supercomputers, and the way fossilized debris has been distributed in the layer corresponding to this moment of history. As for evidence for an asteroid impact, the element iridium is known to be rare on Earth but is common in asteroids. At the K-T (as scientist call it) layer corresponding to 64.5 million years ago, much higher concentrations of this rare element have been detected at sites around the world. Scientists such as paleobotanist Kirk R. Johnson, Ph.D. attribute this observation to the arrival of a massive asteroid hitting the Earth. The main impact site for the asteroid that killed off the dinosaurs. Fossilized tree debris mixed up with ocean floor sediments have been found in the Gulf of Mexico suggesting massive tidal waves had washed back and forth over the impact site, uprooting trees and sending them out to sea in its wake. Source: Norman 1991, p.153. Further evidence for the impact can also be seen at the crater site itself near the Yacatàn peninsula. Here, scientists have found from core samples drilled deep into the ocean bed shocked quartz inside granite rocks that can only be formed under extreme heat and pressures for a very short period of time as occurs during an impact of a rock at high speeds (or the detonation of a nuclear bomb, but we all know the dinosaurs did not have nukes). In conclusion, scientists are quite certain that at least one asteroid had collided with the Earth at this time. Earth towards the end of the Cretaceous period around 69.4 million years ago. Image © 1997 Christopher R. Scotese. As of 2014, an updated map can be downloaded from the Colorado Plateau Geosystems, Inc. web site and created by Professor Ronald C. Blakey of Northern Arizona University (NAU). In total, nearly 76 percent of species (including all the dinosaurs) and 47 percent of genera disappeared. One of the few living descendants of the ruling reptiles is the crocodile (mainly the smallest variety of species, as anything much larger would not have the food supply to support their body mass and required energy levels to stay alive). Crocodiles have survived to the present-day thanks to their locality (found mainly in the tropics), size (a small body requiring less food), and adaptation to a watery environment (water maintains a reasonably constant and relatively warm temperature). A number of birds also survived if they were small and had extensive feathers, and could keep themselves protected from the cold inside certain caves, hollow trees etc. For other animals, hibernation and living underground where the temperatures remained liveable and constant probably played a crucial role in their survival during this apocalyptic event. 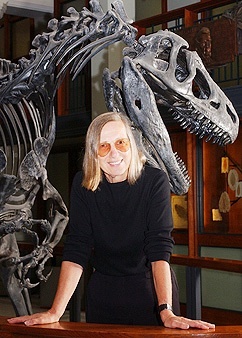 A team of paleontologists led by Professor Gerta Keller of Princeton University in New Jersey, USA, claimed scientific evidence was found to support the view that the impact at the Chicxulub site was probably not enough to destroy the dinosaurs. Keller and colleagues think there was one larger and more devastating impact about 300,000 years after the first impact. Together with massive volcanism in the Deccan Flood Basalts in India pushing the species to the brink of extinction and the accompanying massive global warming formed by the copious greenhouse gases from the volcanoes raising temperatures by 3 to 4 degrees in the oceans (or 7 to 8 degrees on land), were enough to bring down the dinosaurs. The team supports this view through an analysis of the Cretaceous-Tertiary (K-T) boundary containing anomalous levels of excessive iridium (the evidence for an asteroid impact) at 12 sites (including the Yacatan peninsula and in independent locations such as in Beloc, Haiti). 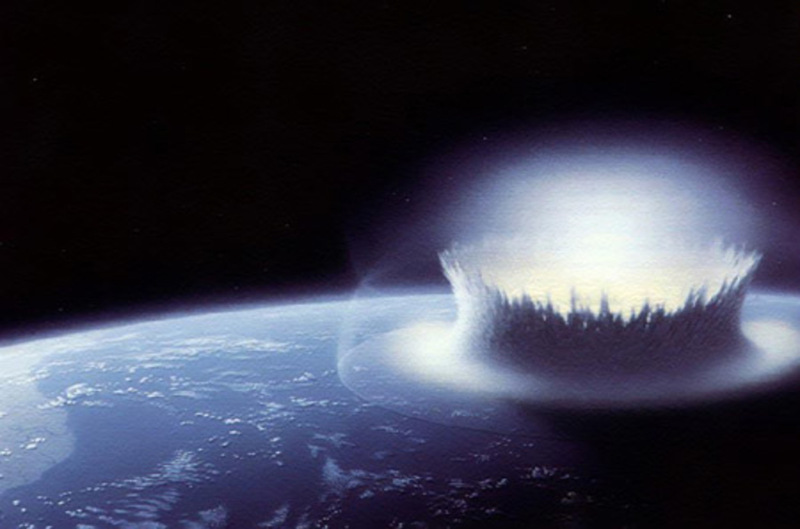 More detailed analysis showed how the Chicxulub crater predates the Cretaceous-Tertiary boundary by about 300,000 years after examining the pattern of reworked glass spherules ejecta (another form of evidence for an asteroid impact) in higher quantities above the K-T boundary. Because of the different layers for the spherule ejecta material and the iridium anomaly in the K-T boundary, it is difficult to see the two as part of a single impact event. 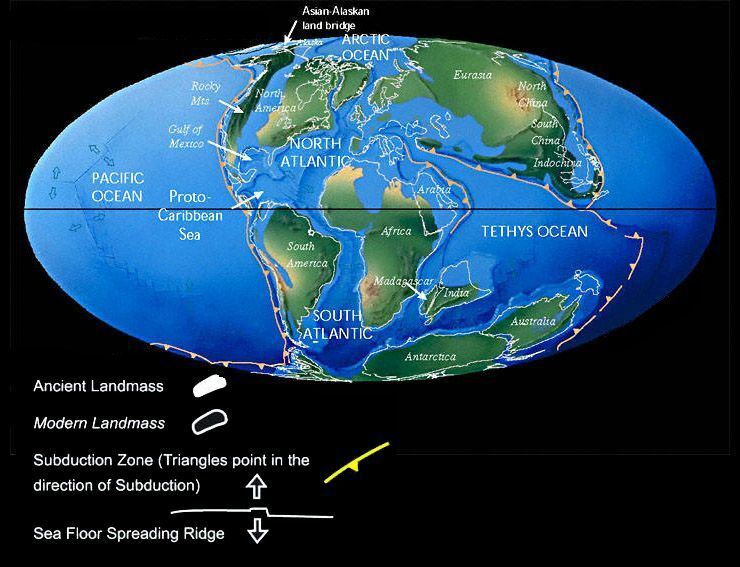 Some scientists tried to reconcile the difference by saying a megatsunami allowed the ejecta material to settle first before the finer iridium layer deposited on top. But this should have occurred in a matter of days after the impact. However Keller and colleagues noticed at various sites how the layers are separated sufficiently and contained microfossil evidence of burrowing organisms in between the layers suggesting a much wider time frame. That time frame has been calculated in the hundreds of thousands of years, not a few days. These results were presented on 24 October 2006 at the annual meeting of the Geological Society of America in Philadelphia, USA. Just one problem: evidence for the second crater or craters responsible for the mass extinction remains elusive and as such it should be called Keller's hypothesis. Nevertheless, it is an interesting hypothesis and would need further work by other scientists to get to the bottom of this catastrophic event(s) leading to the death of all the great dinosaurs. The evidence presented this time involved a sediment core drilled below the ocean nearly 4,500 kilometres from the Yacatan impact site. The distance is important because any drilling at the impact site would not deliver accurate results following the expected earthquakes, landslides and other events that would come to alter the impact site. On extracting and analysing the core, the scientists have found a single layer of impact-related material. There is no additional layer above or below the main layer. The only explanation based on this finding: the event that ended the dinosaurs was a single catastrophic event. As of August 2010, scientists believe a single asteroid had caused the extinction of the dinosaurs. The latest details are available in the 1-hour long 2009 National Geographic documentary titled 24 Hours After: Asteroid Impact. Volcanism can emit some nitrogen  another valuable nutrient for plants  but only to a limited extent. Most nitrogen in the soil is placed there by legume plants from the atmosphere, and the source of most of the nitrogen is from comets that bombarded the Earth in its early history. Charles E. Weber has proposed an interesting theory in his paper titled "Did Termites provide Phosphorus for Ocean Phosphorites and Bone Development in the Cretaceous". Weber has suggested that termites can churn up the soil, smothering plants with the phosphorus rich soil in order to get to the fungi in the wood for food, thereby exposing the soil to greater erosion from rainfall. If this is the case, a significant reduction in phosphorus rich soil could occur. For this theory to be plausible, the termite activity would have to be extensive and widespread and not subject to considerable attacks from predators (e.g., ants). Furthermore, the rainfall needs to be limited in open savannah country. Indeed, regular and/or heavy rainfall in the open savannah is likely to pose a significant problem for the termites, specifically they can get washed away with the soil, making it difficult to establish a colony designed to churn up the soil and make a home at a particular location. In the great rainforests of the Jurassic period, fallen tree logs and an extensive treetop canopy would have provided adequate protection and a source of food for the little critters. Therefore, the rainfall needs to be reduced in the savannah regions to maintain termite colonies in large mounds, which suggest it would take longer for the phosphorus to leech into the oceans. If this ios true, it is most likely the majority of phosphorus reaching the oceans came from other sources. On the other hand, any OAEs detected in the Jurassic period could be explained by these termites through accelerated rates of decomposition of plant and animal matter and regular and widespread rainfall. Or, at the very least, there would have to be a combination of factors involved in the lead up to one of these OAEs through phosphorus leeching, of which termites could pose a more significant contribution in this regard. "The first termites are estimated to have appeared during the Triassic (some believe they have existed during the Permian age), while ants came onto the scene during the Cretaceous period – millions of years later. While ants gone on to diversify into the over 12,000 species known today (and many more still unknown), termites seem to be more or less stuck on the evolutionary scale, with currently 2,600-3000 species estimated to exist." With this in mind, it seems reasonable to say that the trees and ferns that would have existed in great swathes across the supercontinent in the Jurassic period and with sufficient moisture and warmth would have favoured high populations of termites. In the Cretaceous, high populations may have been maintained, although certain insects, in particular ants have come on the scene to potentially target these termites as a source of food. Nevertheless, what we do know about termites is that they can be found "roughly between 50 degrees north and south, with the greatest biomass in the tropics and the greatest diversity in tropical forests and Mediterranean shrublands. Termites are also considered to be a major source (11%) of atmospheric methane, one of the prime greenhouse gases. Termites have been common since at least the Cretaceous period. Termites also eat bone and other parts of carcasses, and their traces have been found on dinosaur bones from the middle Jurassic in China.." (http://www.sydneyspestmanagement.com.au/termites-wiki/#cite_note-26). Whether or not termites are responsible, Weber has recommended that "...paleontologists should analyze the soil profiles associated with fossils for phosphorus in order to get as full a picture as possible" at least in terms of seeing how much phosphorus was available in the soils during the Cretaceous period. The drier conditions experienced by humans on the western side of the Blue Mountains could be reversed (even under global warming conditions in the 21st century) if we create a huge, permanent inland sea where Lake Eyre is located in the central part of the Australian continent. The presence of the inland sea would help to avert two major environmental problems: (i) less winter rain from winds swirling around Antarctica; and (ii) less summer rain when the Indian ocean becomes warmer than the seas between Indonesia, Papua New Guinea and Australia in a condition known as the positive phase of the Indian dipole. These problems tend to exacerbate the dry conditions on land, especially without an inland sea to counteract the conditions. Firstly, it may be possible to minimise the effects of the positive phase of the Indian dipole where warm waters sit in the Indian ocean and colder waters exist north of Australia. Because the winds will flow over the oceans and seas from the cold waters to warmer waters, by having a warm inland sea heated by the desert sun will help the winds flow along another route. As it passes over the inland sea, the moisture laden hot winds can move toward the southeastern parts of Australia where more clouds will appear, keeping the temperatures down. With the help of the Blue Mountains and Victorian Alps, the probability of rain is likely to increase thereby reducing the severity and regularity of droughts. This is particularly important under global warming and during the summer months where the winds swirling around Antarctica and bringing with it some rain in the southern states during the Australian winters are pushed further south. In the summer time this gets worse unless there is an alternative  that is, a great inland sea to help laden the winds with extra moisture. The aim in all of this is to let nature create one of the world's biggest desalination plants and create natural rains using the dry, hot north-westerly winds in the summer to pick up enough water from the inland sea and transport it to the Blue Mountains and southern states where the probability of rainfall will increase and so fill the great Australian river systems. Depending on the height of the Blue Mountains (since it has been weathered away after many millions of years) and the amount of plant cover for keeping moist on the ground (which is, unfortunately, on the decline because of the impact of humans through land clearing and bushfires), the moist westerly winds should rise up along the Blue Mountains sufficiently to increase the likelihood of rain falling on the Western side on a more regular basis and stay on the ground longer with the trees and shrubs acting as ground covers (it should initially be planted along the edges of river systems and creeks). If enough rain falls, the rivers and creeks of Barcoo, Thomson, Coopers, Diamantina and Georgina in Queensland; the Hay, Todd and The Finke rivers in Northern Territory; and The Alberga river in South Australia will fill and eventually replenish the great inland sea back to its former glory. No doubt the Darling River system could do with a good flushing through good rains. Of course, to affect climate in this dramatic and widespread way would require vast amounts of water to be pumped into the Lake Eyre district together with plantings of massive forests to help retain the water on the ground and so Australia could benefit from losing its infamous title of being the world's driest continent (and with it all the droughts). True, some skeptics will argue that such an ambitious project of pumping water to the centre of Australia would be nothing more than a pipedream. The primary reasons being that (i) no pump can push water all the way to Lake Eyre; (ii) digging holes below sea level to allow gravity to force sea water through to Lake Eyre would take too long and be very expensive; (iii) the cost of digging the canal on the surface is also too expensive (presumably for allowing commercial ships to travel through it); and (iv) there was no discernible difference in the local climate at Lake Eyre or its neighbouring areas of the basin. In terms of costs, maybe the Australian people need to weigh up the difference between building such an ambitious water channelling project and the economic costs of dealing with the consequences of droughts, including bushfires, damage to property, and not being able to grow adequate, reliable and cheap food sources on the continent for its people. And there are social costs to consider too, especially for for people who have trouble surviving the hot and dry conditions because of limited resources or who are simply unable to physically cope. "In 1883 a scheme to flood the bed of Lake Eyre was investigated. It was suggested a canal be dug from Spencer's Gulf to Lake Torrens, and then north to Lake Eyre. It was soon discovered [at the time] that the cost of digging the canal would be enormous, too much even for the wildest optimists. 'Sceptics also pointed out that, despite the large area of the Red Sea, it was still surrounded by deserts, contradicting the belief that creating an inland sea would produce a mild climate with heavy rainfall in the surrounding country. Mind you, the costs to establish a large inland sea would not be an issue if the Australian people can see obvious benefits in terms of more reliable rainfall as well as solving all the various social, environmental and economic issues associated with a lack of rainfall should the island sea be established. In terms of climate changes, it is not in the Lake Eyre district where we want the rainfall to occur. Rather, what we want to see is water-laden winds sweeping over the Lake Eyre district to reach a mountain range where clouds are more likely to form, and eventually rain will take place. It is up here, in the mountain ranges, where we want to see the rains fall in generous amounts. And no, people should not be living in the Lake Eyre district when the inland sea is established. In fact, if the project is successful, the regular floods heading its way to the people living near Lake Eyre would probably put an end to their potentially cosy existence in the central part of Australia. To really benefit from this situation, the winds would need to travel a reasonable distance to reach a mountain range. Fortunately for Australia, the Blue Mountains just so happens to be available to achieve this task in a natural way. So, will the climate for south-eastern Australia change to a more wetter and reliable form if the inland sea is established? Good question. It should be noted that changes in the climate for south-eastern Australia leading to greater rainfall has been observed when Lake Eyre is filled up, suggesting a larger volume of water is probably what is required to make the change to the climate more significant, wetter and reliable over the long term. If this is true, what about the enormous task of building the infrastructure to transport water to central Australia? Wouldn't be too great to achieve? Well, we should note that in 1883 people did not have the huge earthmoving machines and more powerful explosives we do today. In fact, in those days, horse and carriage, steam engines and brute force from people hand digging the canal would have been the best anyone could do. Furthermore, we don't need to dig a very deep trench for commercial ships to travel through. A canal not more than a metre deep and perhaps five metres wide should be more than adequate. Or why not use the pipes originally for transporting oil be used to handle water instead? As for taking the straight line route to Lake Eyre, the cost of blasting through some small mountain ranges would probably make it a very expensive exercise. However, to reduce costs, the canal could be made to go around the mountain ranges. Much easier. Perhaps we need to have another look at this idea more closely to see what is possible today rather than relying on old data from last century. A plan in the pipeline from West Australian Liberal Party leader Colin Barnett suggests an untested 3,700-kilometre pipeline canal to pump water from Fitzroy River in the Kimberleys to the city of Perth could be built. Now that Perth is slowly reaching a crisis point in its water supplies, either a desalination plant near Perth or a pipeline to transfer the freshwater to the city should be built soon. However the pipeline project will be expensive and more work is needed to determine the feasibility of such an ambitious project. On the basis of costs, it is likely Perth will choose a desalination plant combined with wind power generation to create hopefully adequate quantities fresh water from the Indian Ocean. However, in the future when agriculture gets seriously affected by global warming to a significant degree because the rivers have dried up and underground water supplies are almost depleted, towns will disappear and people are more likely to move to the cities thinking this is where the water and food is. Food in these places will have to be imported or massive glasshouses built near the cities requiring more desalination plants to be built and a greater demand for jobs and housing by the people. If it gets this bad, cost will no longer be the issue. Survival will drive the Australian population to do anything to reverse this frightening trend, including building pipes and pumps to recreate the inland sea. But will it be too late at this point? Or should we start now? That is a question the Australian people will have to decide at some point in the future. The WA Government in Perth has given the go ahead to build a 50 megalitre desalination plant based on the reverse osmosis process. This is a tiny fraction of the 1,030 megalitres used by the population in Perth, but every fresh water it can produce will be seen as valuable. Winds travelling over Lake Eyre and Broken Hill region has blanketed Yass, Canberra, Sydney and other towns and cities in south-east Australia in red dust and left the sky looking like the place was transported to some point on the surface of Mars. More red dust would get transported to south-east Australia on 27 September. This gives an indication of how likely water-laden warm air is likely to become rain for south-east Australia and putting an end to long-term drought simply by having a large inland sea. 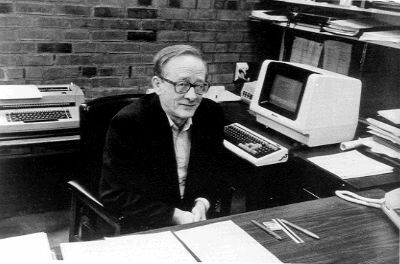 Photograph of David Raup © Patricia Evans. "Attempting to create an inland sea of fresh water would be hopelessly wasteful in Australia. The way to go would be to fill up the ground water. Capital costs would not have to be high. Above ground pipes could be moved when one area was filled. I suspect that most of Australia could be filled in less than a couple hundred years." Probably true. Or better still, talk of ice melting in Greenland and western Antarctica followed by the more resistant ice over the eastern side of Antarctica finally caving in to the increasing global warming conditions will certainly raise sea levels high enough in the next couple of hundred years to see water rushing into the central areas of Australia. Then the people of Australia (if they are alive by then), will know whether the idea of an inland sea did have some merit when it was first proposed at the beginning of the 21st century. In the end, nature will undoubtedly do it for us. So perhaps the truly cheapest solution is simply to do nothing and continue with what we are doing now with our global warming efforts. Then hopefully all the environmental, social and economic problems for the Australian people will be solved by then. We can only cross our fingers and hope this is true. Perhaps great polar ice caps were formed soon after the asteroid impact which helped to trap a large amount of the water in the oceans and so reduce sea levels around the world.